Known as the toughest race on US soil, "The Mint's" legend lives on forever through the lore of one of my favorite authors; and the man that convinced me that I too may able to earn a living as a writer and a boozer. I'm not sure why Hunter chose The Mint 400 race as a backdrop for his Fear and Loathing but I think it was too beautiful a match to consider a coincidence. Having now raced The Mint and read every published word of the man himself I can say they are one in the same. Hunter published a lot of his correspondences and rambling and most of his books are rooted in his experiences traveling the world; and sticking a dirty tobacco stained finger up at anyone that got in the way of his fun. Occasionally he would have to stop to change a flat or have a nap but for the most part, Hunter kept his foot down and prayed that the tires held…..and this my friends is desert racing. There is little difference between stomping around Vegas with a stick, a boiler hat and a brain full of 151 and twisting a class 1 truck through Primm, Nevada, outside that filthy whore that stains the desert between Los Angeles and the Mormons; but I can now say I’ve done both. Like becoming a writer, becoming a racecar driver starts when you can muster up the courage to say “I am a racecar driver.”… Like repeating Candyman in the mirror three times, you can never convince yourself that something beyond your control isn’t going to happen once you mutter the final word. I have spent a lot of time in desirable European cars and on dangerous motorcycles, but I have only ever entered and finished two races in my life – and they both happen to be races that would have made Hunter proud: the Baja 1000 and the Mint 400. And as much as I would like to make it look easy, I think I will forego looking cool and share the entirety of my experience with you. Stefan Johansen, the Former Ferrari F1 driver once told me that it shouldn’t be called motorsport –but instead motorbusiness and the more involved I am with putting my own races together and seeing the struggles of my fellow competitors, I have to admit that this is the part that always makes me just want to walk away disgusted and respect all those that manage to turn up at the start line. As the GGTR evolves, I will return to the subject of raising money and the business behind the stickers and the patches. But remember this – you will be treated like a whore so it’s best to start acting like a classy one. There are many ways to get a car to the races. You can build one yourself, you can buy one, you can rent one, you can share one…. and your choices often depend on the amount of scratch you have available. One way of easing the burden is to find someone that already has a car and enter into partnership with the owner. Again this is business so I would urge you to be VERY clear about the deal and keep it all in writing. Damon Way has been a friend for some years and recently he mentioned he had a Class 1 Buggy that he was trying to sell. It was co-owned with a partner. They had bought and raced the car some years ago but the pressures of being successful captains of industry and family responsibility had kept them out of the 1000mph dust. They were trying to sell the car for a fraction of what it was worth as the economy was currently a cruel mistress. Damon and I had a discussion one day about The Gentleman’s Guide to Racing and I think I piqued his interests. He called me and said, “Hey. We should race the Mint”. Simple and Casual. So I cut a deal with them that I would raise the money and help prep the car; and they would come along and contribute their handsomeness to the GGTR. Even though the car was “prepped” once you start looking at all the components, you start to realize that “we should replace that, we should get that refreshed”. Unlike most motorsports where the engine is the weak link – in desert racing it’s almost an afterthought. The real challenge is making the car indestructible and going over every bolt to decide if we would not regret replacing this component, as we stand out in the cold desert watching other racecars pass by our broken-down heap. In the end we spent about twice as much as we had budgeted for to get the car race ready. Craig, Damon’s partner deserves credit for most of the logistical work that goes with race-prepping a purpose-built racecar. A long checklist was created and slowly put into practice. With two months to get ready, I went to work trying to part some brands with their money and set up partnerships where both would benefit from our desert escapade. With six weeks to go, we took the car out to the desert for the first round of testing. 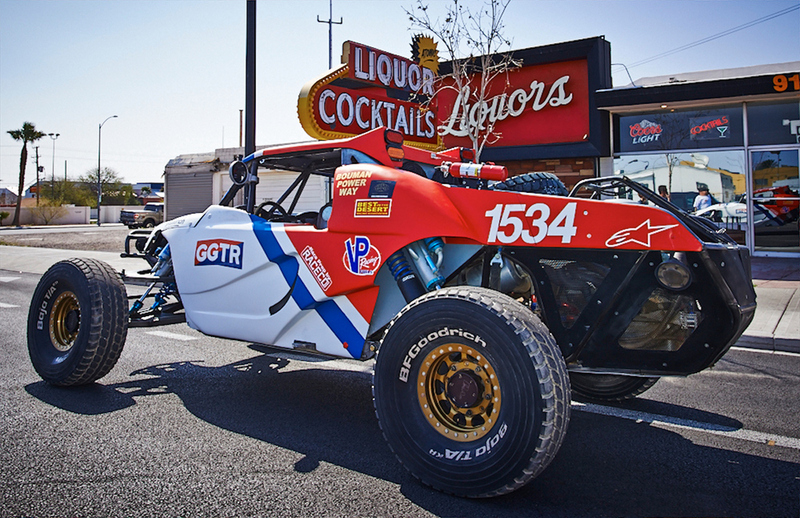 Damon, who lives in San Francisco couldn’t make it, so Craig and his team of mechanics and desert racers came out to the desert near the Outlet Center in Barstow – where most people from LA and Orange county go to test their vehicles. My Baja 1000 experience in the class 16 VW-powered 100 horsepower buggy didn’t translate for much, as I stepped down for the first time on the throttle controlling 650 horses. The suspension was a waterbed compared to the punishment endured with Mr. Roy in Baja. As thrilling as my first ride was, I was certain that I was out of my league and the best thing to do was not say anything to anyone, and hope for a miracle in the form of 20 years’ worth of desert racing experience. The analogy I used to describe the difference between the 16-car and the class 1 was – the 16 is like club dancing with a 23yr old fashion model. The Class 1 is like salsa dancing with a 400lb Dominican prostitute. You have so much more to worry about. She has a mind of her own and at any point she expect you to support her, when she decides to throw herself backwards and kick a leg in the air or spin her arse around with lighting speed, sending you both towards a table full of drinks. In my experience with Latin dancing and large women, I decided a firm hand was required. I was going to be Fred and she would become Ginger. Having just spent a couple weeks at a rally driving School in New Hampshire prepping for a rally race, it was frustrating that I couldn’t just whip the back end of the car around, as I had become accustomed to. The only thing that could cure my fear was seat time in the car… and that was one thing we couldn’t have. With only one more testing session before the race my mind went to work. I spent endless hours studying YouTube videos and running through possible life-ending scenarios. The weeks before the race were a blur of trying to earn a living, disappointment with people who were negating on promises and cutting any deal I could. BFGoodrich, Alpine Stars, Bell Helmets, Beard Seats, GoPro and VP Race Fuels did stand up and take a chance on the undeniable passion, I presented them with. Kelly Kocher, a helmet painter somewhere in Middle America, also stepped up and took on the task of painting the helmets on his Sunday off. I remember speaking to him on the day. Kelly and his workmates were somewhere clear across the country, having never met me in person, sacrificing a day with their families or away from the paint fumes, for me and the dream of redefining and reviving the true spirit of Gentleman’s Racing. In the two instances where I truly convinced myself to back out, it was the investments made that stopped me. Our final testing session in Barstow saw the whole team convene for the first time. Other racers Like Brandon, Sean, Skinny Greg, Andy, mechanics Nick Perez and his brother all came out to support the effort and didn’t give us any of the standard flat-billed desert racer attitude you would expect from people, that might mistake me for another rich guy who has bought his seat in the car. Damon and I spent some time in the car together and I felt like our friendship would take on another layer through what lay ahead. Like when men go to war together, there is something about risking one’s life in the pursuit of some mutual ideal that bonds you for life. 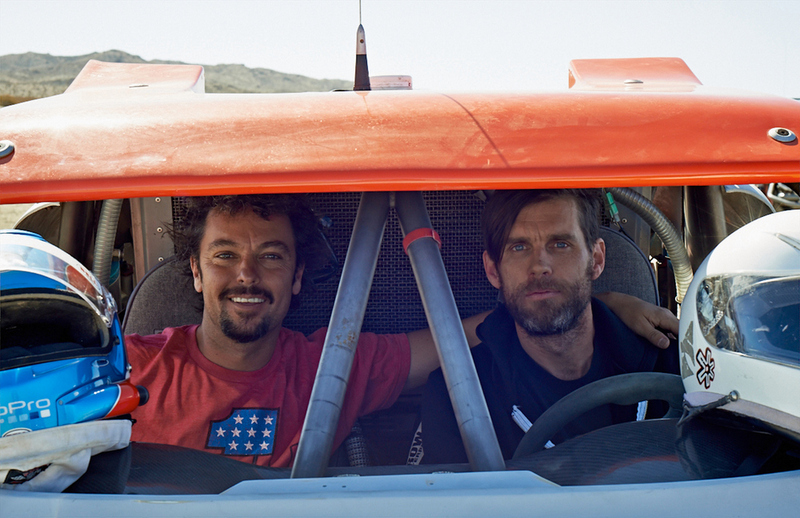 Alex Roy and I spent weeks on end in the desert, pre-running in BAJA and then spent a full day in the car racing together. I was reminded of that achievement and that friendship. Craig, with the help of the Perez brothers, lived up to his end of the bargain and delivered a beautiful racecar to Las Vegas. Even though the race is on Saturday, they had to be there Wednesday to qualify Thursday morning. The realities of my bank account meant I had to stay in LA and work till Thursday night, and miss the qualifying. Craig being a southern California kid was raised racing dirt bikes and buggies in the desert – in my eyes this was a good and a bad thing. This guy knew what his abilities were but he also has the competitiveness, that often ends with the car on its roof and some broken vertebrae. Craig and Damon raced the qualifying and it wasn’t until breakfast the next morning did we see the results on themint400.com– Craig’s face couldn’t mask his disappointment when I told him we were 3rd from last in our class. Desert Racing has many different Classes. Trophy trucks or Trick Trucks are the 900 horsepower, million-dollar purpose built “pick-up trucks” then there is Class 1 which is a tier below, but still competes with the trophy trucks, if the right person is behind the wheel. Then there is a long list of Class 8, Class 10, Class 12, Class 16… all divided by some technical differential like suspension travel or performance adjustments made to the engine, etc. The Mint no longer allows motorcycles as too many where getting caught under the tires of the big trucks. So Saturday’s race day would be divided into two races. A 5 am start for all the limited cars and then a noon start for the unlimited, of which we would be a part. Two hundred seventy eight vehicles with over a thousand registered drivers and co-pilots. Friday is registration and tech inspection. As the racecar joins the long queue of cars waiting to be inspected, we had to make our way to the Ballroom of the Plaza Hotel to sign away all liability that results from our stupidity of taking part in this madness. Like the pros we decided to enter a three-seater into the morning race in the Sportsman Class so we could get a look at the course – (the Mint 400 doesn’t give you time to recce the course). I left the registration holding two plastic bags full of Mint 400 goodies with two participant armbands firmly clasped to my left wrist – one for car number 1834 and one for 1534. The rest of the afternoon was a flurry of prep and making sure everything is right. Helmets and suits need to be inspected, as they are only valid for a certain lifespan. The car gets scrutinized by a team of men that have no problem sending you to the back of the line, if even one of your brake lights is out. Again the Perez brothers and Craig did us proud. The car passed and we were now entered into The Mint f*cking 400.